Students sit together on the ground floor of Norris. 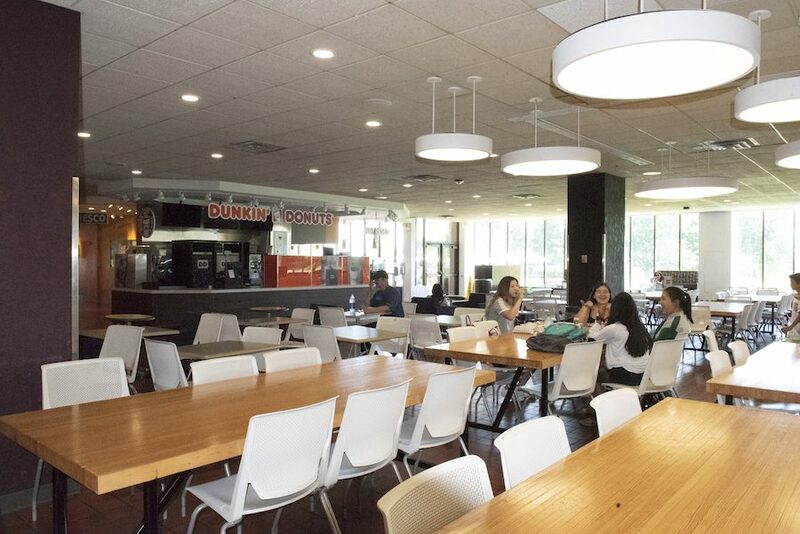 Dunkin’ Donuts will be one of two current vendors to continue operating under Compass Group. In early June, it was reported that Frontera Fresco would be the first restaurant in Norris University Center to close its doors as part of the University’s transition from Sodexo to Compass Group North America. When the transfer officially begins on July 1, more Norris dining options will join Frontera as restaurants of the past. Jeremy Schenk, executive director of Norris, said the only Norris vendors that will continue to partner with Compass are Starbucks and Dunkin’ Donuts. The other food concepts on the ground floor of the building will be replaced by national and local restaurants. Schenk added that Norris will also add Asiana Foodville, an Asian-inspired restaurant that will replace Viet Nom Nom, which had taken the place of International Station. The space that was formerly occupied by Frontera will become home to Juicy Lucy, a new concept that is being developed by Amy Morton, a local chef and owner of Found Kitchen and The Barn Evanston. “Juicy Lucy is a type of hamburger out of Minneapolis where they stuff the cheese on the inside, so when you bite in, it kind of explodes melted cheese into your mouth,” Schenk said. In addition to the burgers, the new concept will also include chopped salads, milkshakes and pressed juices, he said. MOD Pizza, a Seattle-based national build your own pizza brand, will take the place of The Kiln, and the existing salad bar will be expanded into a “higher-end” salad option called Roots and Seeds, Schenk said. He added that the C-Store will also be updated into a market that is three times larger. While renovations on these food concepts are scheduled to be completed in late August, two temporary restaurants will be open for the summer starting July 2, according to a Thursday news release. Burger 847 and Build pizza will serve the NU community in the former Frontera and Kiln locations until the permanent locations are ready for business. A third dining option will feature local Evanston restaurant, La Cocinita, in a food truck outside Norris starting July 9. Beyond Norris, Lisa’s Cafe will be updated with national brand Plum Market and the menu at Fran’s Cafe is likely to change as well, Schenk said. As part of the food hall concept, MOD pizza will shift out to where the computer and print station currently stands, and seating will be interspersed throughout the restaurants. Schenk said the hallway behind Frontera will also be removed to give the new market more space. The upgrades in Norris are intended for completion by move-in day in the fall. Weinberg sophomore Sonali Patel said she likes the new food hall concept. Schenk added that Compass is also building an app to allow mobile ordering in Norris, letting students place an order while walking from class and pick up their food as soon as they arrive. “It’s an experience where students can build community through food,” Schenk said.